Like outflow channels, valley networks can run for thousands of kilometers, although most are only hundreds of kilometers long. Also, the channels in a valley network are usually 1 to 5 kilometers (half a mile to 3 miles) wide, instead of ten times that or more. These valley networks drain into local places where the topographic elevation is low. Valley network channels cut deeply into the surface and most have wide, flat floors or U-shaped cross sections. But the single factor that defines valley networks is their organization, which closely resembles river valleys on Earth. Valley networks form branching systems that are hierarchical. This means small tributaries merge together from higher elevations to form larger tributaries at lower elevations. These in turn merge with more tributaries, again and again, eventually forming a major stream. Tracing all the tributaries and channels in a valley network makes a pattern that looks like the branching of a tree or its roots. Most valley networks have Noachian ages, that is, they mostly date before about 3.7 billion years ago. Yet some are younger, being Amazonian in age, the most-recent period that began about 3 billion years ago. Also, most valley networks lie in the heavily cratered highlands. Some valley networks appear to have formed by small-scale flows of groundwater, somewhat like when a stream on Earth emerges from a spring, although with a greater flow. These grew through a process of undermining the surface (geologists call it "sapping"). On larger scales sapping creates chaos regions. But most valley network channels were eroded by water flowing across the open surface. Perhaps the water fell as snow, then melted. Or perhaps it fell as rain. 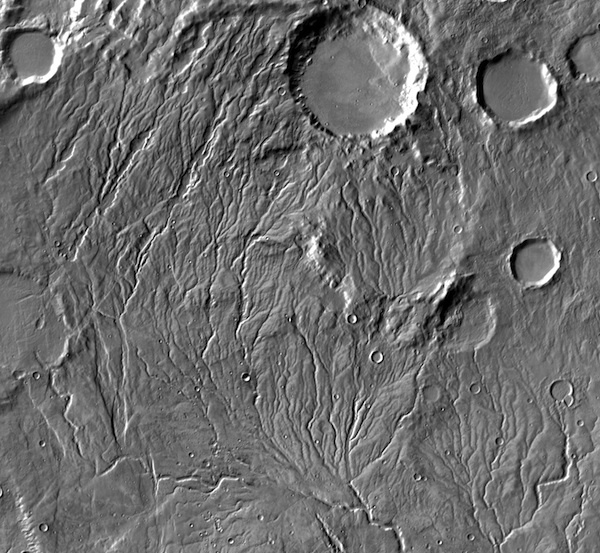 In either case, the existence of valley networks is powerful evidence that Mars once had a thicker atmosphere and a warmer and wetter climate.